A Twitter account dedicated to calling out racism is identifying people who attended the weekend rally in Charlottesville, Va. — using photos culled from the news and social media and listing their places of employment and other information. One of the social media posts resembled a wanted poster or a missing-persons flyer: Photographs of men were arranged in rows, seeking their names and employers. But the Facebook post wasn't circulated by law enforcement in the search for a suspect or by relatives looking for a missing loved one. It was an example of ordinary people trying to harness the power of social media to identify and shame the white nationalists who attended last weekend's violent rally in Charlottesville, Va.
A Twitter account dedicated to calling out racism identified people who attended the rally using photos culled from the news and social media and listed their places of employment and other information. "I'm a white Jewish man. So I strongly believe that white people in particular have a responsibility to stand up against bigotry because bigotry thrives on silence," the creator of the account, Logan Smith of Raleigh, N.C., told The Associated Press. Using the handle YesYoureRacist, his account grew from around 64,000 followers on Saturday to more than 300,000 by Monday afternoon. A website created Sunday dedicated itself to collecting the names, social media profiles, colleges and employers of people photographed at the rally. At least one person has lost his job as a result. Together, the efforts showed that angry online groups can be used to renounce racism as well as promote it. "The goal with online shaming is very short term and driven by people's desire to feel as if they are fighting back and having an impact," said Brian Reich, author of several books on digital communications, behaviour and political influence. "They are afraid, appalled and they want to stop it." But is it helpful? Reich said the people behind these efforts "are arguably fanning the flames," giving attention to a group — white supremacists — that feeds on attention. Nicholas Brody, professor of communications at the University of Puget Sound, said the events show that in the age of social media, "nothing is really anonymous anymore." People attending a white supremacist rally decades ago may have had the comfort of knowing that their schools, employers and disapproving family members probably wouldn't find out about their activity. These days, not only can information be quickly and widely shared, but a lot of data is available about people on Facebook, Twitter and LinkedIn. Image searches and facial-recognition technology, meanwhile, can make it relatively easy to identify people online. Smith said he called out the people pictured in photos from the rally through a combination of tips from former classmates and others and online sleuthing. In Canada at least one group is working to out white supremists, too, including those who have voiced support online for the rally attendees in Charlottesville. Anti-racist Canada (ARC) — which describes itself as a group of people with a "common desire to fight hatred, bigotry, intolerance and violence" — is using its website to call out white nationalist activity (WARNING: contains graphic language that may offend some readers) on and offline. The group has been blogging about the events in Charlottesville and curating online posts from Canadians who have applauded the violence on social media. ARC has also been tracking the activity of an Alberta–based far-right group called III% Alberta. But the method isn't foolproof and reportedly sent one misidentified man into hiding over the weekend. A photo of one rally attendee — a torch-bearing man wearing an "Arkansas Engineering" T-shirt — was at one point identified as Kyle Quinn, an assistant professor in that university's biomedical engineering department, where he runs a wound-healing lab. Quinn and the man in the photo are both white, have beards, heavy builds and, presumably, some connection to that university. But around the time when the photo was taken, Quinn was 1,770 kilometres away, having dinner with his wife, according to a story in the New York Times. Angry messages, calls for his dismissal and his home address quickly appeared on social media and — fearing for their safety — Quinn said he and his wife stayed with a colleague over the weekend. "I've dedicated my life to helping all people, trying to improve health care and train the next generation of scientists, and this is potentially throwing a wrench in that," he told the Times. "You have celebrities and hundreds of people doing no research online, not checking facts." By mid-day Tuesday, the Twitter feed had not directly acknowledged the mistake, though some commenters had posted the Times story and warned against the dangers of naming the wrong names. "How would it make you feel if somebody killed that man because of something you posted? This is completely irresponsible," wrote one commenter. Another warned: "Identifying the wrong person is dangerous, unfair, and maybe illegal. Don't tarnish the good work you do." 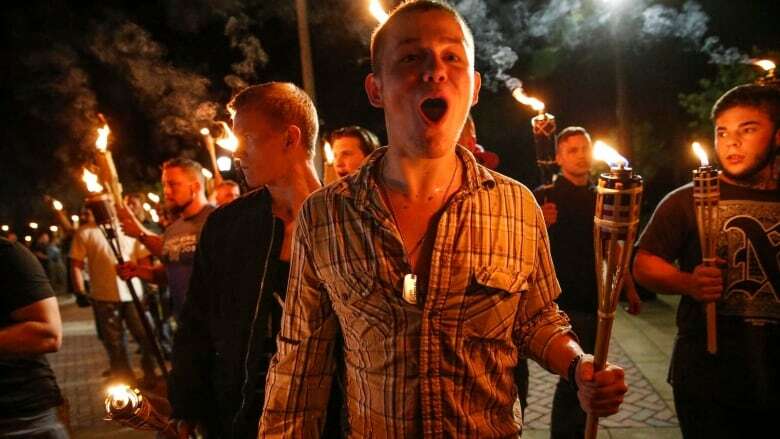 Peter Cvjetanovic, a 20-year-old college student, was photographed shouting with a group of torch-wielding protesters Friday during a march through the University of Virginia campus. Cvjetanovic said in a television interview that he didn't expect the photo to spread as widely as it did. But spread it did. And thousands of people signed an online petition to have him kicked out of school. Cvjetanovic told a local TV station that he is "not the angry racist they see in that photo," but a white nationalist who cares for all people. The University of Nevada in Reno confirmed Monday that Cvjetanovic is a student there. Spokesperson Kerri Garcia said the university is "still monitoring the situation and reviewing information." A message left for Cvjetanovic through the school was not returned. There was no telephone listing available for him in Reno. Meanwhile, Top Dog, a hot dog company in the San Francisco area, said one of its employees resigned after being confronted by management about participating in the rally. The practice of publishing private or identifying information — such as an address or phone number — about people online in an attempt to hurt, shame or abuse them is known as "doxing." In the 1990s, anti-abortion hackers infamously exposed abortion providers' home addresses, photos and other information on a now-defunct website called the "Nuremberg Files." Names that were greyed out indicated people who had been "wounded." A strikethrough meant they had been killed. Collecting and posting publicly available information, such as a photo of a person attending a public protest, is not the same thing, even if that can still hurt or shame people. Paul Levinson, a communications professor and social media expert, called it a "moral obligation" to expose white supremacists for who they are, something for which social media provides a good opportunity. Gordon Coonfield, communications professor at Villanova University, said there is an important difference in the reasons people get doxed. "Doxing an advocate of racial equality is an implicit — and often explicit — call for violence against them," he said in an email. "Doxing a white nationalist is a call for accountability. Compelling individuals to be accountable for their words and deeds online or off is not a threat to freedom of expression. It is the foundation of freedom of expression." Case in point, Smith said, he has received many death threats because of his Twitter posts, so he will consider whether to continue. "They got a hold of all my personal info and have been threatening me and my family and even my wife's family," he said. Of course, mere presence at a rally does not imply willing participation. Tiki Brand Products, whose torches were used and widely photographed during the rally, took to Facebook to distance itself from the march. "We do not support their message or the use of our products in this way," the company wrote on its Facebook page. Our products are designed to enhance backyard gatherings and to help family and friends connect with each other at home in their yard."